We hope you’ll join us on Thursday, July 18, 2019 at the ninth annual College Changes Everything® (CCE) Conference – the state’s preeminent annual college access and success and career readiness event. This one-day conference focuses on effective practices and showcases the programs and services available to help with increasing college access and college completion for students in support of the state’s Goal 2025 – to increase the proportion of adults in Illinois with high-quality degrees and credentials to 60% by the year 2025. For our state to reach this goal, stakeholders that make up all aspects of any student’s community must work together to support and provide students with the knowledge and opportunities to be successful along the transitions from education to employment. At the conference we will also recognize the tenth anniversary of the Illinois Student Assistance Corps, or ISACorps, our statewide outreach and near-peer mentoring program. As we all know, simply making financial or informational resources available is not enough to truly provide opportunity for our underrepresented students. For the past decade the ISACorps has been helping students from families without college-going experience by providing additional support to navigate the complex process of planning and preparing for postsecondary success. The ISACorps is the largest statewide near-peer mentoring program in the country, annually serving more than 150,000 students and parents in every community in Illinois. ISACorps members are recruited as they graduate from college and make a two-year service commitment to the state. These talented college graduates are as diverse as Illinois and spend their days (and nights, and weekends) helping families understand the education-to-career pipeline and complete the admission and financial aid processes. ISAC is currently recruiting for the 2019-20 ISACorps, with a start date of June 2019. For your reference, a copy of the ISACorps job description can be found online at the ISAC Career Center. As the conference draws a broad group of professionals and stakeholders, we welcome proposals that cover a wide range of topics related to college access and completion and career readiness. Such topics might include, but are not limited to: college and career readiness; student retention, persistence, and completion; programs and services for underrepresented students; educational equity; partnerships; career development experiences; education, business, and the economy; college costs, financial aid, and affordability; and community stakeholder engagement. Deadline – Priority consideration will be given to completed session proposal forms submitted by Friday, March 8, 2019. Non-Commercial Policy – Please note that sessions are to be non-commercial forums. Individuals should refrain from using brand names or endorsing specific products. Sessions are not to be used as a place for direct promotion of products and services. Conference Registration – Presenters are to register for the conference, and the registration fee is $40.00. Conference registration will open later this spring. 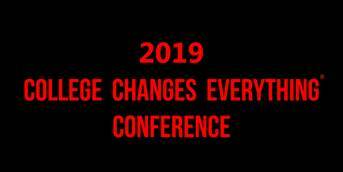 Presenter Compensation – The College Changes Everything® Conference does not provide any compensation for individuals accepted to serve as conference interest session presenters. This includes compensation for travel-related expenses and hotel accommodations. A key strength of the conference is its bringing together a diverse audience from across the state to focus on educational opportunity and student success: college access practitioners; high school leaders, counselors, and case managers; college and university leaders and administrators; employers and workforce development professionals; and policymaker and elected officials interested in higher education and career readiness. The conference also serves as an opportunity for stakeholders to improve their practice of collaboration and collective leadership as we work toward the state’s goal. The conference will take place at the Tinley Park Convention Center, Tinley Park, Illinois. by the Illinois Student Assistance Commission.